A handrail can be one of the most striking features of any building. They are built from solid timber and often beautifully carved on the corners and turns. Although they are often the finest piece of woodwork in a building, they are generally overlooked and through bad finishing or wear and tear, blend into the background and go unnoticed. Our latest service product, is aimed at restoring this fine woodwork back to its former glory and at a small fraction of the replacement cost. Because handrails are made from solid timber the price of replacement is large. On top of the timber, the labour costs can be very high, as it takes a specialist joiner to fit and carve each section of a handrail. The handrail will then still need to be finished. 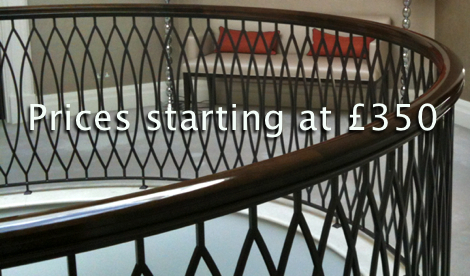 Restoring a handrail, rather than replacing it, is very cost effective and can cost as little as £350. Restoring rather than renewing your handrail is also the environmentally friendly choice. The image on the right, shows the basic process we go through to restore a handrail. First we strip the old finish off, using chemicals (using a sanding machine can damage the timber and causes huge amounts of dust). Once the finish is removed we are returned to the bare timber beneath. The next step is to stain the handrail to the required colour. This is an important step, as our stain penetrates into the timber and allows the grain and figure to show through, rather than dulling them with the slightly opaque colour used in modern techniques which put colour on to the surface and hides a lot of what is beneath. The final stage is the polishing, where we build up the handrail with many layers of polish, to achieve a beautiful finish. This is done with a traditional French polishing tool, called a Rubber. There is no other way to achieve the finish that a Rubber can, as it slowly builds up a film of polish on the handrail, which is free from any brush marks and works deep into the timber, rather than sitting on the surface as other finishes do. Once dry, polish will not chip like Lacquer and will hold it’s lustre like no other product. Our finishes can be taken to any sheen, matt, satin, or gloss. At a fraction of the handrail replacement cost we will fully strip the old finish off and re-polish with the best traditional techniques and the finest French polish finish. There is seldom a need to replace a handrail. This is a full restoration service, which will return your handrail to it’s former glory.